This IR beam break set (about $12 per set on eBay) can be used up to 5m apart. The individual model numbers are E18-5DNA and E3F-5. The transmitter side has 2 wires; blue = ground, brown = 6V – 36V DC. The receiver side has 3 wires; blue = ground, brown = 6V – 36V DC, black = output. It has an NPN output and pulls to ground when the beam is broken. 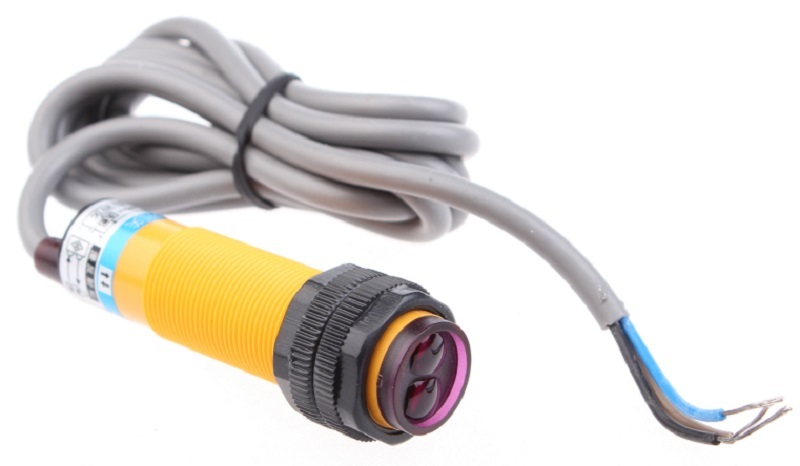 This IR reflective sensor (about $6 – $7 on eBay) can be used to detect objects up to 80cm away. A screwdriver adjustment near the wire entry sets the detection range. The model number is E18-D80NK. The unit has 3 wires; blue = ground, brown = 6V – 36V DC, black = output. It has an NPN output and pulls to ground when an object is detected. There are other versions of this sensor that have a 10cm, 30cm or 50cm ranges.